Butternut Cashew Chili ~ A delicious heart healthy, meatless chili with butternut squash and cashew nuts. I know … what self-respecting man is going to want meatless chili on Super Bowl Sunday? You may know someone that would throw a flag on this game plan – but hear me out. This chili delivers on the flavor and the cashews give you a first down on the texture. Alright – enough with the football references. I’m just cheering (oops) on our meatless Monday meals and this one would be great for a meatless Sunday! My husband, who has always loved meat and chili, drafted this recipe to be a first round pick in our recipe book. It tastes likes chili but also packs so much hearty, healthy goodness, you may never bench this recipe! 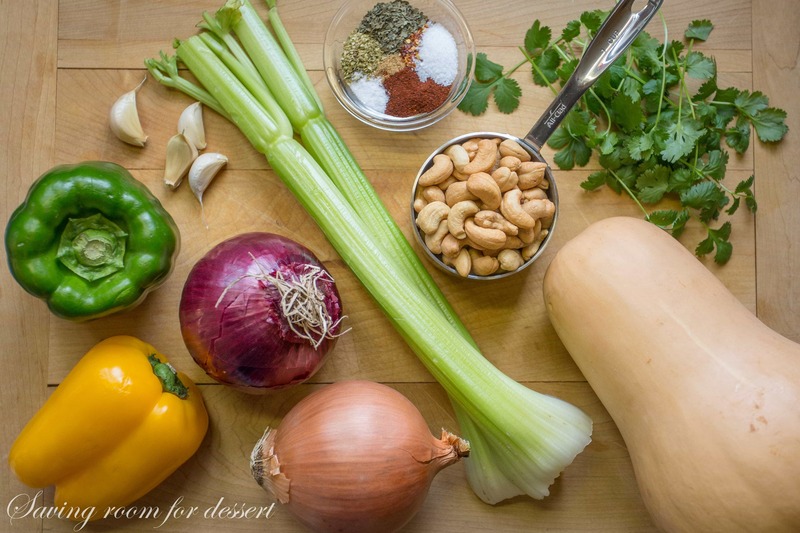 You can substitute chicken or beef for the butternut squash and cashews – and I’m very sure it will turn out great. This chili packs a big flavor punch with plenty of spice. The broth may look a little thinner than meaty chili, but it’s not like a water based soup. 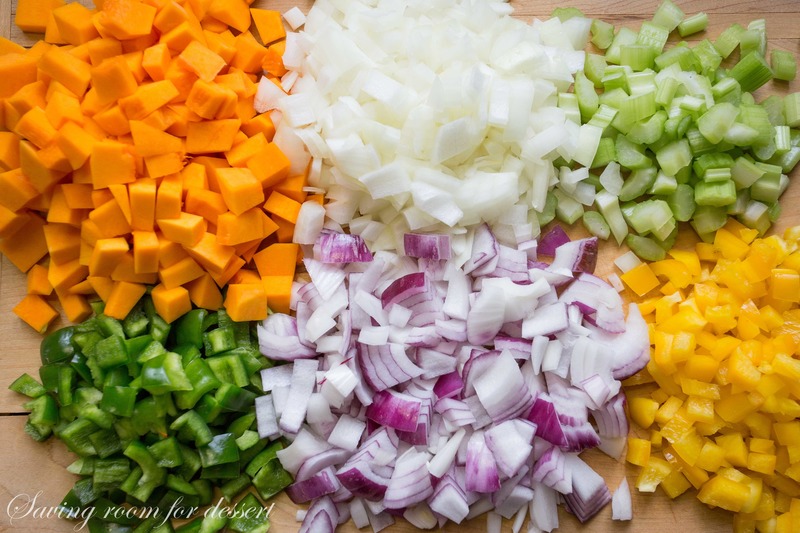 Chop up a few peppers (green, yellow, or red) two onions, a couple of stocks of celery and about 2 cups of butternut squash. Add red kidney beans, black beans, canned tomatoes, cilantro and some cashews and simmer just until the squash is tender. Garnish with avocado, fresh cilantro or a good dollop of sour cream and grated cheese. 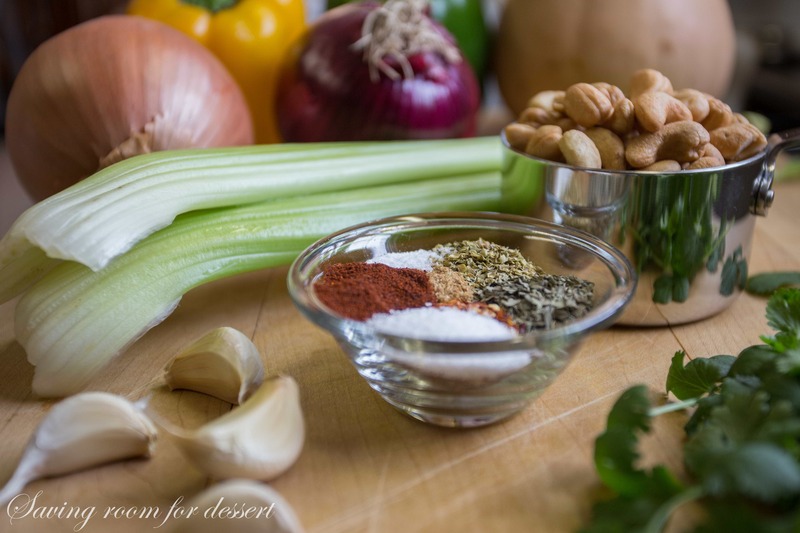 Hearty healthy and delicious – score! Don’t forget to PIN to your favorite soup and chili board! 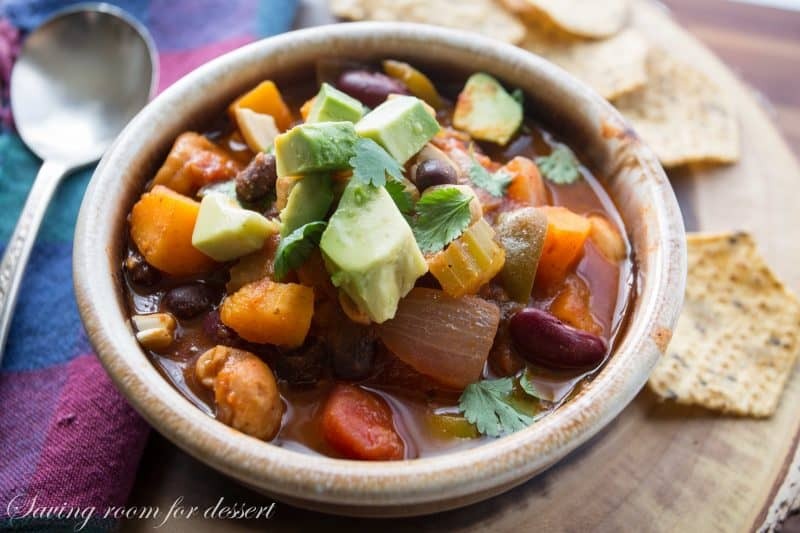 A delicious heart healthy, meatless chili with butternut squash and cashew nuts. Heat 3 tablespoons olive oil in a heavy bottom large soup pot over medium-high heat. Add the butternut squash and saute for 4-5 minutes, then add the onions, peppers, garlic and celery. Stir and cook for about 8-10 minutes or until the vegetables are starting to soften. Add the remaining 1 tablespoon olive oil to the vegetables and all the spices. Stir and cook for about 1 minute. Add the tomato sauce and canned tomatoes to the vegetables and reduce the heat to medium. Simmer gently for about 15 minutes stirring occasionally. Add the beans, cashews, chopped cilantro and red wine vinegar. Cover, with the lid tilted to vent and gently simmer stirring occasionally, until the vegetables are tender, about 15 minutes. Garnish with cilantro, cashews, avocado, sour cream or cheese to taste. I know we would really enjoy some deliciously cheesy dip and gooey appetizers – but we save room for the splurges when we can. Eating right doesn’t mean you have to give up flavor for calories – this chili proves it – wanna see an instant replay? Hope you favorite teams wins and thanks so much for stopping by! I just made this recipe in my newly purchased InstaPot! Sauteed in the pot and set to high pressure for 8 minutes. So fast. So delicious. One tweak to the recipe here – I substituted the squash for some sweet potatoes, hope you don’t mind! Anyway, I am sitting back and watching the big game, my girlfriend (a meat lover) even enjoyed it! I LOVE that you made this recipe in an InstaPot – I will give that a try. I love your substitution too – sweet potatoes are so good. I think it’s a great adaptation. Thanks for trying it and for letting us know how it went! Reckon I could even get my meat loving Pete to enjoy this. He’ll never miss the meat (maybe) great to hear from you Mandy! This is so wonderfully chunky and colorful! My husband normally *requires* meat in his meals, but I think I might be able to sneak this past him…it sounds so robust with the cashews! 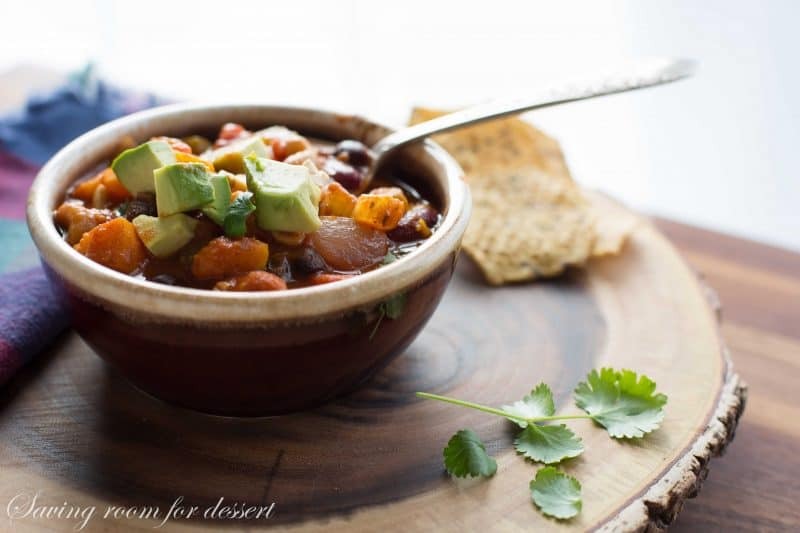 We love a healthy chili like this one any day of the week – not just for game-time! BUT we won’t tell the boys and spoil the fun- will we? Delicious – we’re now having your chili for dinner tonight- thanks Tricia! Great point Monica!~ We are in tune – connected – second helpings – woohooo!! Hi Tricia, the super bowl is right here in AZ!!! Yea! actually I really don’t care about the game at all just want to make the day special for my husband. I know he would love this chili. Thanks so much Becky! Football is not for everybody. We actually love baseball more 🙂 Something about sitting out in the warm weather drinking a cold beer and eating my once a year hot dog – can’t wait! Aww thanks Tanna! I really do feel better eating this way – even though I adore a good steak or juicy tender chicken – but it’s all about saving room for the good stuff 🙂 Have a lovely day! I can eat this every day as it has my favourite butternut!! Delicious and so good for you too, Tricia. I don’t have a favorite team in this upcoming competition, so I’m just going to watch it for the food. 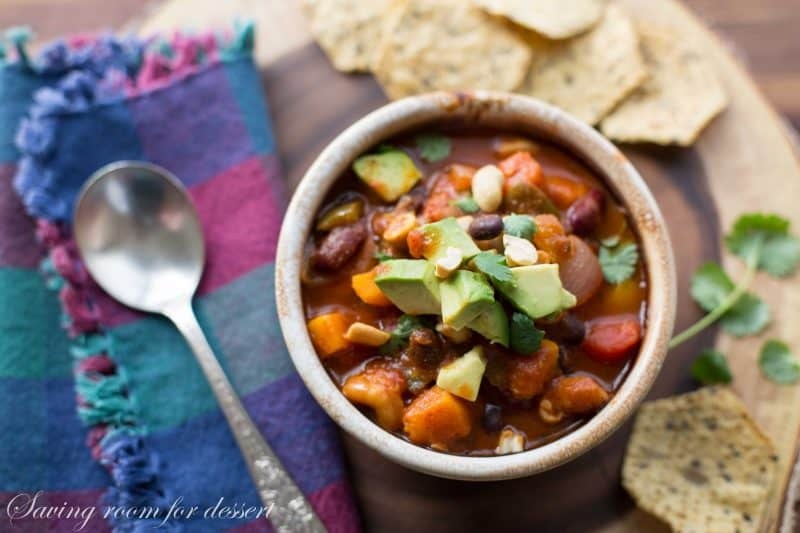 🙂 I love this meatless chili- I’ve made a chili with sweet potato, but not butternut. The cashews are a wonderful addition too, and I bet they give it a great crunch! The vegetables are all so pretty, and make a gorgeous bowl. I’m hoping for no school tomorrow, but I’m only counting on a delay. We’ll see! I’m with you Betty I don’t have a favorite team either. Sorry they didn’t close school today – but I guess that’s one less day you have to work this summer. Hope you have a lovely day anyway!